You just shot hundreds of frames and now you have to sort them? You want to sort them by quality or by subject/topic? Using a picture archiving/organizing like ThumbsPlus (great software, BTW!) can be too slow and over-powerful to assign categories to the images. Apple's iPhoto offers rating within a slideshow. I tried to find a free software for Windows that does the same. I couldn't find it so I decided to write one myself. After initial tries with Matlab I had a fast&working rating slideshow, but I could not compile the code to a standalone application. So I bit the bullet and wrote a programme in VisualBasic. A great help was the page of Rod Stephens: www.vb-helper.com. It is very well organised and full of great tips&tricks. I was made aware of the software Pixort: www.pixort.com/, which does exactly what I had in mind. I haven't had time to thoroughly test it, but it seems mighty fine. So check it out! It allows you to rate images on the fly and directly move them into appropriately named subdirectories. You can do rating and categorizing this way. It is an 11kB download, so what do you have to lose? Just drop it into a directory and start using it :) Please note: This is a Beta version. I am publishing it in good faith that it will do no harm to your files. But I cannot guarantee it! Please test it in a test folder first. I will not have access to Visual Basic for some time starting next week. At the moment RateSlide does not support RAW files. I hope to be able to add RAW support. In the meantime, you can use the pef2jpeg tool by Mr. Okawa to extract the embedded JPEGs from the PEF RAW files. Please respect my and Rod Stephens' intellectual property and if you publish modified software, pelase include a link/credit to those involved. 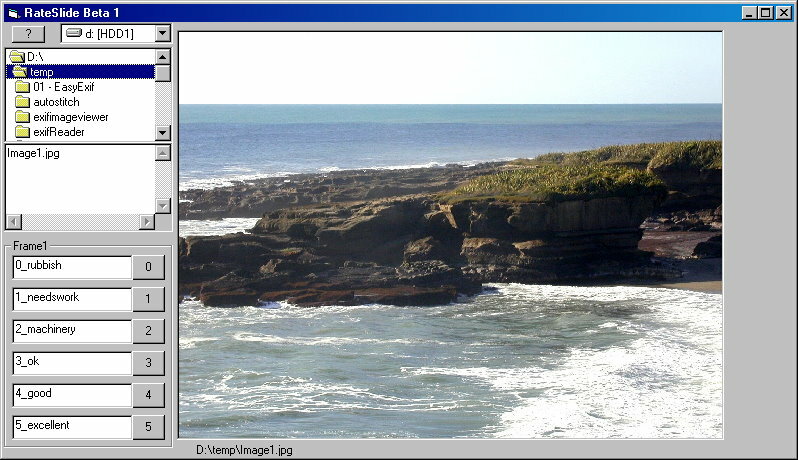 If you know how to extract the embedded JPEG from RAW files with Visual Basic 6, plase drop me a line! I'd be especially interested in getting it to work with Pentax DS PEF files.